It is universally true that a people’s worship reflects their conception of what God is like and what their relationship to Him should entail. This was certainly true in the case of Israel. As the people to whom the true God chose to reveal Himself, and as the recipients of His covenant, the Israelites were entrusted with the holy task of worshiping God in the manner He prescribed. While the nations around Israel practiced idolatry and became like their gods—whether lustful or cruel—Israel was to propagate the true worship of God. This is what made Israel’s long slide into idolatry so grievous to God. The people indulged in false worship of every kind, and did so greedily with delight. But even when they grew weary of their ways, the people of Israel (in this case, the southern kingdom of Judah) continued on in their sinful worship. But even when conditions had reached their worst and Israel’s eventual destruction and exile were prophesied, God did not completely cut off His inheritance. If the people of Israel would come back to God in contrition and practice the worship that pleased Him, including its ethical elements of justice and mercy, the nation would be gloriously restored. Why did the righteous people in Israel die without anyone noting the fact that those who pleased God were being taken away? What could the faithful people in Israel, those who worshiped God in truth and sincerity, expect to receive in contrast to those whose ways were evil? Why was God not pleased with the people’s fasting as an act of worship? 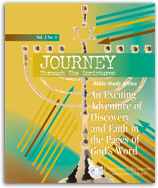 How would the people of Israel find true joy in the Lord? Many Fellowship friends will recognize Isaiah 58:7 as the theme verse we chose for our lifesaving ministry, Isaiah 58, to suffering elderly Jews and children in the former Soviet Union. Let me take this opportunity to thank you for your compassionate response to the plight of these, the most vulnerable remnants of Israel in a harsh land.